After my trials and tribulations with cucumber soup this week, going to see an author reading about Thoreau seemed somehow inappropriate. The most recent blog deadline had already rushed past and the desperation that filled my life was anything but quiet. What was I writing this stupid blog for anyway? Didn’t I already have enough pressures in my life? Wasn’t it time at last to quit nattering and move on? The weather wasn’t cooperating either. As the mercury reached into the high 90’s, the warmth sapped the energy right out of me. At least I didn’t suffer from heat stroke like our poor guinea pigs. But the conditions were hardly ideal for soup-making. Yet there the cucumbers sat on my counter reminding me of my weekly duty to the Internet. I patiently peeled each cuke and scraped out their seeds until they looked like the sort of dugout canoes Thoreau himself might have used. Then I chopped them up, threw them in a pot with all manner of other ingredients—onions, mint, lemon juice, milk, apples, okra! The soup that came out of all this was practically a sin against nature. And for me that’s bad, really bad. I’ve had a reverence for the wild as long as I can remember. Whether I’m in the forest, the desert, the mountains, even the prairie, I always feel myself stirring back to life as my ego dissolves into the wilderness. However, this doesn’t square with my memories of Thoreau. My recollections about Walden center on the writer’s obsession with the price of the beans he grew, his detailed listing of the yield of each of his various crops, how much they cost and what they sold for. I know I’m probably missing the forest for the trees in my understanding of Thoreau, but that’s something I never have a problem with when I’m out in nature myself. Perhaps Thoreau had the same feelings for nature that I do, but it seems like he’d be more at home with a good cost/benefit analysis and would have been even happier if he’d had access to a spreadsheet. Still I love Thoreau’s description of men’s lives being filled with “quiet desperation.” That’s exactly where I was once I’d given up on the week’s first attempt at cucumber soup. Lucky for me, that’s when the weather broke and with it the funk I’d fallen into, or was it more of a hissy fit? As a terrific thunderstorm split the sky, I drove back to the store, got some more cucumbers and started again. This next version was going to be a cold soup, based on the Greek cucumber and yogurt sauce known as tzatziki. If I were Thoreau, I’d probably have made do with the first soup. Rather than obsessing about its awful flavor and texture so much that I flushed the whole thing down the toilet, I would have savored the freshness of the individual ingredients. But then Thoreau was out there all by himself, I’ve got a family to feed. You try telling your kids to ignore the flavor of a dish and focus on the freshness of the ingredients. We had the second soup for lunch yesterday along with a delicious vegetarian couscous salad. And while I appreciate Thoreau’s vision of making do with less, I went ahead and had a second helping. Blend the ingredients together in a 3 quart soup pot then puree with an immersion blender. Chill in the refrigerator for a few hours or overnight. 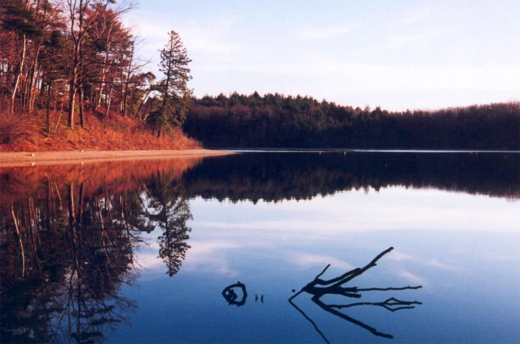 Image Credit: “Walden Pond,” from the Earth First! website. I’ve never been to Walden pond, but I introduced my kids to Thoreau early, through the book Henry Hikes to Fitchburg. If you’d like to get a terrific, more modern take on Thoreau, check out the new book Cabin Fever by Tom Montgomery Fate. Read it over a nice bowl of soup. It was fun living through the 2 soups and enjoying the second one. Also going to Tom’s talk and continually running into him. As soon as our weather warms up a little (we’re going through our annual ‘June Gloom’) I’m going to make the Tzatziki Soup, it was delicious.